The contralto took a deep breath, began to sing — and then her voice cracked. Her eyes welled as she read the lyrics on her music score. 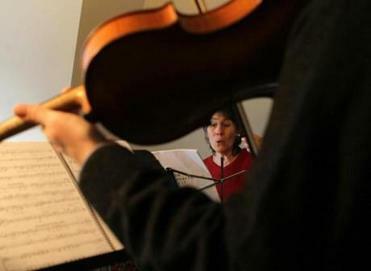 The piece that compelled the Jamaica Plain singer to tears, written by Newton composer Francine Trester and titled “Rescue,” refers to a quote by Fred Rogers that reassures that, whenever something scary happens, look for the helpers, who will always be there. As the anniversary of the Boston Marathon bombings draws closer, locals are confronting the tumble of emotions provoked by the shocking attack last year that resulted in three deaths, hundreds of injuries, and immobilization of the city and its suburbs. Two projects have set those varying dimensions of feeling to music, lyrics, and prose: Trester’s six-song piece, “A View from Heartbreak Hill,” and the 40-minute play “The Psalms Project: Mile 25.8,” written by Lexington Christian Academy theater director Christopher Greco. Both of the complex and emotional projects will be performed for the public in several events leading up to the April 21 Marathon. 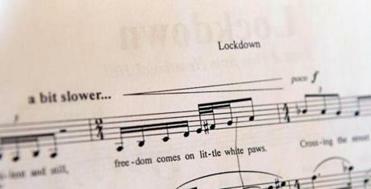 Music from the song "Lockdown." Performed by 16 academy students, “The Psalms Project: Mile 25.8,” weaves excerpts from seven Biblical psalms with the stories of several local people directly impacted by the Marathon. Those include a spectator and a runner who was stopped less than a half-mile from the finish line (the mile marker referenced in the play’s name). Using those remembrances with psalms, the play moves back and forth between the contemporary world and the ancient. The set is abstract and constantly transforms, Greco explained, with the use of such props as a doorway on wheels and a large blue tarp that mutates from turbulent waters to the sky to the Marathon finish line. 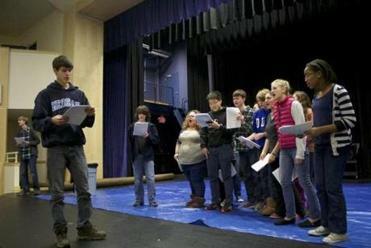 A rehearsal of the marathon play at Lexington Christian Academy. And, although he noted that the town of Lexington wasn’t officially locked down, many of the school’s students were, and the school year launched with lock-down drills. “This is very much alive in our school community and in the psyche of our students and faculty,” he said. Written for a trio of viola, piano, and contralto, the aptly titled piece takes its name from the half-mile ascent in Newton between the 20- and 21-mile markers, where many runners report fatigue. The cycle starts out with “Speechless,” based on the Department of Homeland Security’s “If you see something, say something” campaign. Woolweaver’s bow bobbed lightly over his instrument, plucking out low tones; both complementing and intentionally clashing with Shapiro’s high, staccato notes. After this line, the final piano note faded in the still, quiet studio. “Tough stuff,” Woolweaver said finally. Meanwhile, “Lockdown” the next song in the cycle, illustrates just that; Trester describes how her neighbor’s fat striped cat was able to explore the outside world while all the humans were trapped indoors during the manhunt for Dzhokhar Tsarnaev. “It was unsettling, unnatural, and unreal,” she recalled. Elizabeth Anker sings during a rehearsal. “Transit” portrays Trester’s first commute to work after the bombings, when things were supposed to be getting back to normal, a feeling shattered when the driver announced that Copley Station was closed down until further notice; “Still” describes a beautiful spring day at the park, but with flags notably remaining at half-mast; and “Out” expresses anger and outrage at the death of a child. “The sonorities are so beautiful, expressive, and rich,” said Shapiro, seated at her piano, also describing the songs as “prosaic and poetic. A sense of hope is also something Greco strives to instill with his play. It ultimately offers a “buoyancy and lightness,” celebrating willpower, human capability, overcoming fears, and the essential human need for support. Scott Woolwearer played the viola during the “A View from Heartbreak Hill" rehearsal. “The Psalms Project: Mile 25.8” will be presented at 7 p.m. on Feb. 20, 21, and 22 at The Cross Center at Lexington Christian Academy. Advance tickets are $10 for adults and $5 for non-Academy students; tickets at the door are $12. 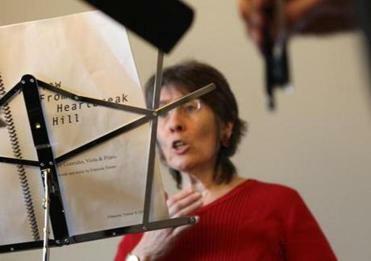 “A View from Heartbreak Hill” will be performed at 7:30 p.m. on Feb. 20 at Berklee College of Music; 2 p.m. on March 2 at the Newton Free Library; and at 6 p.m. on April 10 at Harvard University.